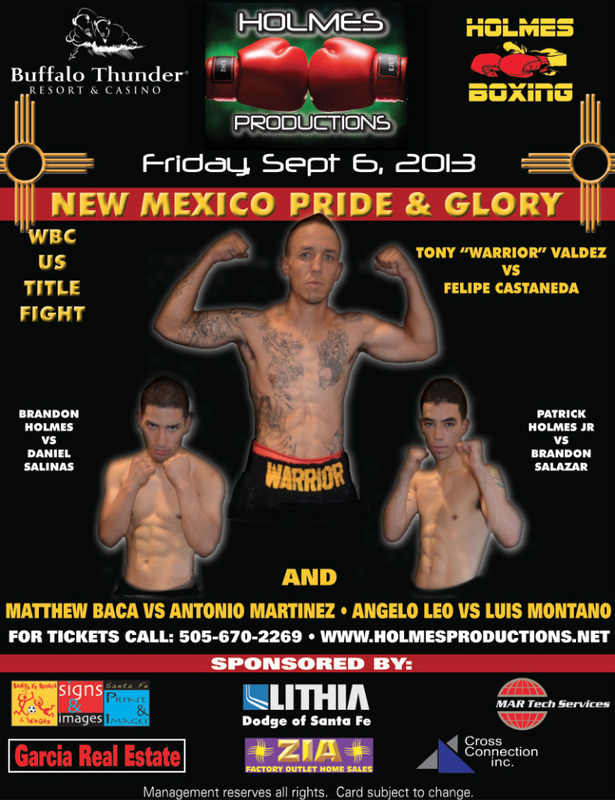 Thursday afternoon at 2pm inside Club Warehouse at Buffalo Thunder Resort and Casino, the weigh-in for Holmes Productions’ New Mexico Pride & Glory card will take place. The fight which takes place Friday night will also be held at the Buffalo Thunder Resort and Casino, in the facility’s Tewa Grand Ballroom. Headlining the bill is a WBC United States (USNBC) Super Flyweight title battle between northern New Mexico’s Tony Valdez and San Antonio, Texas’ Felipe Castañeda. Expect to see a good crowd on hand as Santa Fe’s boxing brothers Pat and Brandon Holmes will likely bring a large contingent.